Companies in the financial sector know a thing or two about return on investment (ROI). The very nature of their business is predicated on looking at several different options and figuring out where money is most likely to generate more money—for themselves as well as their customers. So when it came time for a large-enterprise banking company to put its money toward a new print management solution, which solution do you think it chose? The independent research firm TechValidate recently surveyed this company to see if its investment in PrinterLogic had been as successful as it had hoped. The resulting case study (TVID: AFD-A01-6BD) affirms that it definitely was. Yet all those reductions amounted to much, much more savings over time. 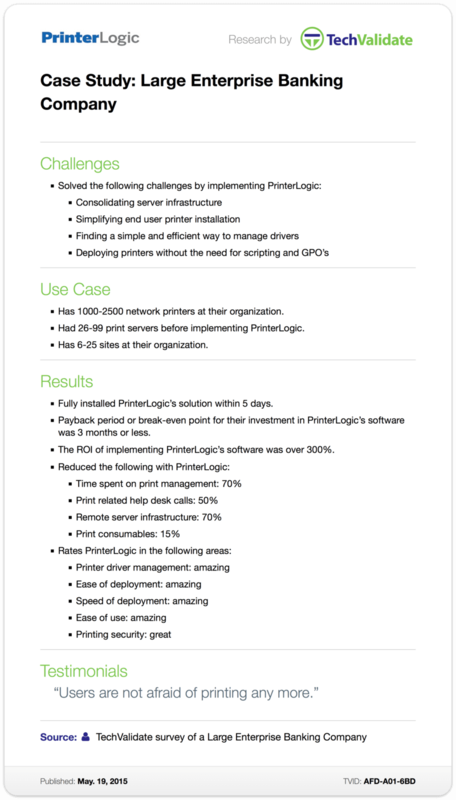 At the time of the TechValidate survey, this company had seen ROI of more than 300% after implementing PrinterLogic’s print management solution. It doesn’t take a financial whiz to know that’s the kind of return that would make any investor proud. One company representative said, “Users are not afraid of printing any more”—all thanks to PrinterLogic. So ROI is one thing, but conquering users frustration and apprehension toward enterprise printing? You might say that’s priceless. Contact us today for a free demo to see if we can help you reduce costs and increase efficiency in your printing environment.